You don’t need to spend countless hours in the gym to sculpt the strong arms and physical confidence of a character like Wonder Woman. You just need to commit to a consistent strength training regimen. Two to three total-body resistance training sessions a week are enough to build muscular strength and to stimulate changes in body composition, and those sessions don’t need to be long or drawn-out. If you can carve 30 minutes from your day to dedicate to your workout routine, you can start carving those shoulders, biceps and triceps. Perform each exercise for 45 seconds, followed by a 15-second break as you rotate to the next exercise. When you’ve completed all of the exercises, rest for two minutes before continuing. You’ll perform the full circuit three times. Wall Balls: Stand facing a wall and hold a medicine ball at your chest in both hands. Squat down, keeping your weight in your heels, lowering your glutes until they’re at or below parallel with the ground. Powerfully press through your heels to extend your knees and hips, and as you do, throw the medicine ball as high as you can against the wall. Catch the ball as it drops back toward the ground, and continue the exercise. Lunge with Arms Overhead: Stand tall with your arms extended over your head — you can hold dumbbells or a medicine ball to make the exercise more challenging. Take a large step forward with your right foot, planting your heel before bending both knees, lowering your back knee toward the floor. When your front knee forms a 90-degree angle, press through your right heel and extend your knee to stand up as you simultaneously take a large step forward with your left foot. Perform a lunge with your left leg and continue the exercise, alternating legs with each lunge. Single-Arm Kettlebell Chest Press (Right Arm): Lie on a bench with a kettlebell in your right hand, your arm extended directly over your chest. Engage your core and inhale as you bend your right elbow and lower the weight toward your chest — use your abdominals to keep your hips from rotating to the right as you lower the kettlebell. When your elbow bends to 90 degrees, exhale and press the weight upward, extending your elbow to return to the starting position. Single-Arm Kettlebell Chest Press (Left Arm): Perform the exercise detailed above, but switch arms, this time holding the kettlebell in your left hand. Renegade Row: Set up in a high push-up position, gripping a kettlebell or dumbbell in each hand so your bodyweight is being supported by the tool. Keeping your core tight and your hips steady so your body maintains a straight line from heel to head, lift one weight from the ground, bending your elbow and drawing the weight toward your chest as you squeeze your shoulder blade toward your spine. Return the weight to the ground and repeat on the other side. Continue alternating sides. Hanging Knee Raises: Hang from a pull-up bar, your arms slightly wider than shoulder width apart. Engage your core and bend your knees to draw your knees toward your chest. Slowly and steadily extend your legs back to the starting position, really focusing on using your abs to perform the exercise rather than momentum gained from swinging. Dive Bomb Push-ups: Start in a downward-facing dog position with your hips pressed up toward the ceiling, your legs and arms extended so your body forms an upside down “V” shape. Bend your elbows, lowering your head between your arms. As your head nears the floor, look forward and begin pressing your chest and torso forward as you continue to extend your hips and lower them toward the ground. As you press your chest forward, extend your elbows and lift your chest, ultimately entering an upward dog position, so your legs are hovering just off the ground and your torso is tall and forward-facing. Reverse the movement to return to the downward dog position and continue the exercise. Mountain Climbers: For a quick burst of cardio at the end of your circuit, set up in a high pushup position, supported by the balls of your feet and your hands. Draw one knee toward your chest, placing your foot lightly on the ground. From this position, hop both feet into the air, switching their locations — extending the bent knee and bending the extended knee. As soon as both feet touch the ground, immediately hop them back into the air again to continue the exercise. Move as quickly as you can with good form. Tabatas are a specific style of high-intensity interval training where each Tabata lasts four minutes, consisting of eight rounds of 20 seconds all-out effort followed by 10 seconds rest. For this workout, you’ll perform three different Tabatas, each using two exercises that you’ll alternate between. After each Tabata, you’ll rest one minute before proceeding to the next series of exercises. When you’ve completed all three Tabatas, you’re only halfway there. Give yourself one extra minute of rest, then repeat all three Tabatas a second time. Tip: It’s a good idea to download a Tabata timer on your smartphone to automatically time the intervals for you. Mountain Climbers: Set up in a high push-up position, supported by the balls of your feet and your hands. Draw one knee toward your chest, placing your foot lightly on the ground. From this position, hop both feet into the air, switching their locations — extending the bent knee and bending the extended knee. As soon as both feet touch the ground, immediately hop them back into the air again, alternating foot position. Move as quickly as you can with good form. Burpees: Stand with feet shoulder width apart. Squat down, placing your hands on the ground between your feet. Hop both legs back into a high plank position before bending your elbows and lowering your chest to the floor. Push up from the floor to return to high plank before hopping your legs back to their starting position. From this low squat, jump up into the air, clapping your hands over your head. Land lightly on the balls of your toes with your knees and hips slightly bent, your core engaged. Immediately drop your hips and squat down to continue the exercise. Thrusters: Hold a set of dumbbells in your hands at your shoulders, your legs slightly wider than shoulder width apart, your toes angled slightly outward. Engage your core and press your hips back, lowering into a squat position. From the bottom of the squat, press forcefully through your heels to extend your knees and hips, returning to standing. As you do, press the dumbbells straight over your head, extending your elbows. Immediately bend your elbows to bring them back to your shoulders before you continue the exercise. Inchworm Push-ups: Start standing with your feet hip distance apart. Tip forward from the hips, reaching your hands to the ground in front of your feet, keeping your legs straight. Walk your hands forward, allowing your hips to lower as you walk forward until you’re in a push-up position with your core engaged and your torso straight. Bend your elbows and lower your chest to the floor to perform a push-up. Press through your palms to return to the push-up position, then walk your hands back toward your feet. Use your glutes and hamstrings to pull your torso back to standing. That’s one repetition — continue the exercise. Dancing Crab: Start in a tabletop position supported by your feet and hands, your hips lifted toward the ceiling. Engage your core and lift your left hand and right foot off the ground simultaneously as and reach to touch them across the front of your body. Return your hand and foot to the floor before repeating on the other side. This exercise requires a fair amount of balance, so move slowly and focus on form until your balance and core strength improve. Bear Squats: Start in a high push-up position with your core engaged and your palms under your shoulders, with your feet positioned wider than hip distance apart. Bend your knees and press your hips back, extending your shoulders upward to move your body into a squat-like position, always keeping your knees from touching the ground. When you’ve pressed your hips back as far as you can, extend your knees, returning to the high push-up position. This workout consists of two separate circuits, each of which you’ll perform a total of three times. The first circuit focuses on upper body strength and the second focuses on lower body strength. Perform each exercise for 50 seconds, resting only long enough between exercises to switch to the next move (about 10 seconds). After performing all four exercises back-to-back, rest one minute before repeating the circuit two more times. After completing all three rounds of the upper-body circuit, immediately follow with the lower-body circuit. Jumping Jacks: Stand tall with your feet together and your hands at your sides. Jump up into the air, spreading your legs wide as you simultaneously sweep your arms out and up, raising them over your head. 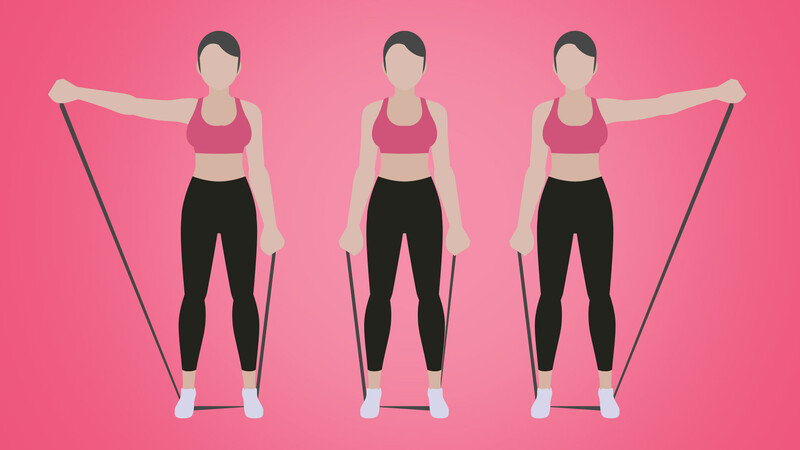 When your feet land, immediately reverse the exercise, jumping up into the air to draw your legs back to your midline as you sweep your arms out and down, returning them to your sides. Continue as fast as you can for the duration of the exercise. Banded Push-ups: Set up in a high push-up position with a resistance band wrapped over and across your shoulder blades, anchored in place with your hands. The band should be stretched tight in this high push-up position. Bend your elbows and lower your chest toward the ground. When your elbows are bent at 90 degrees, press through your palms and extend your elbows, pressing against the resistance of the band to return to the high push-up position. Continue the exercise. Superman Banded Lat Pulls: Wrap the center of a resistance band around the base of a sturdy pole. Lie on your stomach and grasp an end of the band in each hand so the band is taut when your arms are extended straight over your head. Engage your core and lift your feet and shoulders slightly off the ground. Maintaining this lifted position, squeeze your shoulder blades toward your spine and bend your elbows, pulling the resistance band tight as you draw your hands toward your shoulders. Slowly reverse the movement, extending your elbows over your head. Continue the exercise. Banded Lateral Shoulder Raises: Stand on the center of a long resistance band, holding one end of the band in each hand at your sides. Engage your core and raise both arms out to your sides, pulling against the resistance of the band while keeping your elbows straight. When your arms are lifted to shoulder height, slowly reverse the movement and return your hands to your sides. The lower-body circuit is identical in format to the upper-body circuit. Perform each exercise for 50 seconds, resting only long enough between exercises to switch to the next move (about 10 seconds). After performing all four exercises back-to-back, rest one minute before repeating the circuit two more times. Marching Twists: Stand tall, your feet hip distance apart, your core engaged, and your elbows bent at 90-degree angles. Position your arms so your hands are lifted over your head with your elbows extended out to the sides as if you were giving a “touchdown” sign. From this position, lift your right foot from the floor, bending your knee and drawing it toward your chest as you simultaneously twist your torso to the right, reaching your left elbow to your right knee. Lower your right foot as you twist your torso back to center, then repeat on the opposite side. Continue alternating sides for the duration of the exercise. Squat Jumps: Stand tall, your feet wider than shoulder width apart. Engage your core and swing your arms back as you press your hips behind you, bending your knees to lower yourself into a squat. From a deep squat position, powerfully explode through your feet as you swing your arms over your head, extending your knees and hips as you jump up into the air. Land softly on the balls of your feet with your knees and hips slightly bent before rolling back to your heels to continue the exercise. Sprinter Jumps: Stand on your right foot, your left knee bent behind you with your elbows bent at your sides. Tip forward from the hips, leaning your chest toward the ground as you reach your right arm back and your left arm forward. From here, powerfully press through your supporting foot as you jump from the ground, drawing your left knee forward and lifting your torso to an upright position as you swing your right arm forward and your left arm back. Land softly on the balls of your feet and catch your balance before repeating the exercise. Perform half of your set supported on your right foot before switching sides. Sprinter Sit-ups: Lie flat on your back with your legs straight and your arms extended next to your sides. Engage your core, and in a quick and powerful movement, sit up, drawing your right knee to your chest as you rise. Slowly extend your leg and lay your torso back down to return to the lying position. Repeat on the opposite side and continue alternating. This total-body strength training routine features a straightforward circuit. You’ll perform each exercise for 45 seconds before resting for 15 seconds, making sure to repeat unilateral exercises that target one side of the body on each side before proceeding to the next movement. After performing a single circuit of eight minutes of work, you’ll rest for two minutes. You’ll perform the circuit three times through. Modified Pull-ups: Find a sturdy bar that’s positioned parallel to the floor at roughly chest height or slightly lower. Grip the bar and walk your feet forward until you’re hanging under the bar with your arms extended and your feet touching the ground, your body positioned at an angle. From this position, bend your elbows, squeeze your shoulder blades toward your spine and pull your chest toward the bar. Reverse the movement and lower yourself slowly back to the starting position. Continue. Sumo Squat to Jack Jump: Stand with your feet wider than shoulder width apart, your toes angled outward. Engage your core and, keeping your torso upright, squat down, reaching your hands toward the ground. When your knees are bent at 90 degrees, press through your heels and jump up into the air, sweeping your arms out to the sides and over your head. As you jump, quickly squeeze your legs together at the height of the jump before immediately swinging them outward again so you land with your feet wide, in their original position. Continue the exercise, moving as quickly as you can. Single-Leg Deadlift (Left Side): Stand balanced on your left foot, your knee slightly bent and your right leg extended behind you. Engage your core and keep your torso straight as you tip forward from the hips, reaching your hands toward the ground as you raise your right leg behind you. When your torso is roughly parallel with the ground, squeeze your left-side hamstring and glute to pull your torso upright, returning to the starting position. Single-Leg Deadlift (Right Side): Repeat the previous exercise, this time balancing on your right leg. Lateral Medicine Ball Throw (Left Side): Stand about two or three feet away from a sturdy wall with your left side facing the surface so your body is perpendicular to the wall. Position your feet shoulder width apart and hold a medicine ball with both hands at your abdomen. Bend your knees slightly and shift your weight to your right foot as you rotate your core slightly, bringing the medicine ball to your right hip. Powerfully shift your weight to the left as you twist your torso and shoulders toward the wall, throwing the medicine ball across your body and into the wall. Catch the ball as it bounces off the wall and immediately twist back to the right to “load” the exercise again. Continue the movement. Lateral Medicine Ball Throw (Right Side): Repeat the previous exercise, this time positioned so your right side is closest to the wall. Biceps Curl to Shoulder Press: Stand tall, your feet hip distance apart, knees slightly bent. Hold a dumbbell in each hand with your arms extended at your thighs, your palms rotated so they’re facing away from you. Keeping your upper arms fixed to your sides, engage your core and bend your elbows, drawing the dumbbells to your shoulders as you perform a biceps curl. Once the dumbbells reach your shoulders, rotate your shoulders back as you twist your hand in and forward until your palms are facing straight ahead. From here, press your arms directly over your head, extending your elbows. Reverse the movement, lowering the dumbbells back to your shoulders before rotating your palms inward and lowering the weights back to the starting position. Triceps Chair Dip: Sit on the front edge of a sturdy bench or chair with your palms gripping the front of the seat directly under your glutes. Step your feet forward until your legs are extended, your heels on the ground. Press through your palms and extend your elbows to lift your hips off the bench. Bend your elbows straight back to lower your glutes toward the floor. When your elbows are bent at 90 degrees, press through your palms to reverse the movement and extend your elbows, pressing yourself back to the starting position. This total-body cardio workout will challenge your upper body and core every bit as much as your lower body. Spend 10 minutes performing each type of cardio, alternating between 30 seconds of high-intensity effort and 30 seconds of lower-intensity recovery time. 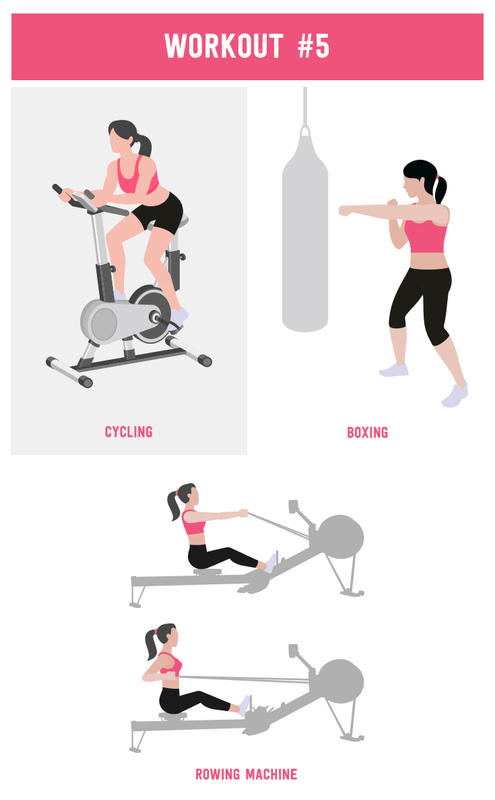 Rowing machine: Use a cardio rowing machine to tax your lower body, core and upper body all at the same time. Remember to keep your low back and abs engaged and your torso tall throughout the exercise to maximize the workout’s effectiveness. Really focus on proper form, extending your legs first to drive your glutes away from the machine before leaning back and pulling your arms toward your chest. Boxing: If you have access to a boxing bag, use it. Perform fast and hard right-arm jabs for 30 seconds, followed by 30 seconds of lower-intensity alternating jabs, then switch arms, performing fast and hard left-arm jabs for 30 seconds. If you don’t have access to a boxing bag, simply shadow box following the same sequence. Remember to stay light on your feet and to keep your core engaged. Cycling: Finish up your cardio with a lower-body-focused bout of cycling. Simply increase the intensity for 30 seconds by ramping up the resistance on the bike or the speed of your pedaling. Follow with 30 seconds of lower-intensity effort. Continue alternating for the full 10 minutes.